Today I will post about how to use Excel Sheet as a database with Selenium. Sheet 2 – Products: Now, you can create other sheets with information about the products or something that you want. If you have any questions, just write below ! Refactoring is one of the techniques that allows us to be agile and apply an evolutionary approach to our design. A core XP practice and one of TDD’s pillars, constant refactoring keeps the evil design upfront at bay and maintain our codebases in a healthy state. One of the few things I think most developers agree on is that refactorings are helpful and should be done at some point in any project, preferably in a continuous manner. The problem is that, like every other developer term, the definition of refactoring has become muddled over time. Refactoring is now commonly conflated with it’s more dangerous cousin, the Rewriting. The term is used whenever we want to improve the design of some part of a codebase, either a single class or entire subsystems. Although they existed a long time before that, Refactorings were introduced to the large world by Martin Fowler’s book Refactoring: Improving the Design of Existing Code where he writes about coding practices from legendary SmallTalkers like Kent Beck and Ward Cunningham. A definition from the same book: “Refactoring is a disciplined technique for restructuring an existing body of code, altering its internal structure without changing its external behavior. Its heart is a series of small behavior preserving transformations. Each transformation (called a “refactoring”) does little, but a sequence of transformations can produce a significant restructuring. Since each refactoring is small, it’s less likely to go wrong. The system is kept fully working after each small refactoring, reducing the chances that a system can get seriously broken during the restructuring.” The original refactorings were presented using a pattern format. They have names, likeExtract Method or Replace Temp with Query, an explanation of when to use the refactor and a list of steps you have to follow in order to apply them. You can browse the refactorings catalog on refactoring.com. They are meant to be applied in a conscious manner, one after the other, until your design is good enough for you to move forward. Words like disciplined and small are present on the very definition of the term. When you wildly rewrite large parts of your system, you are not refactoring, even if you are just trying to achieve a better design. The system needs to be kept working the whole time. That means the tests need to stay green! The TDD flow is supposed to be Red -> Green -> Refactor, and not Red -> Green -> Red -> Red -> Oh nooooo! -> Rollback. 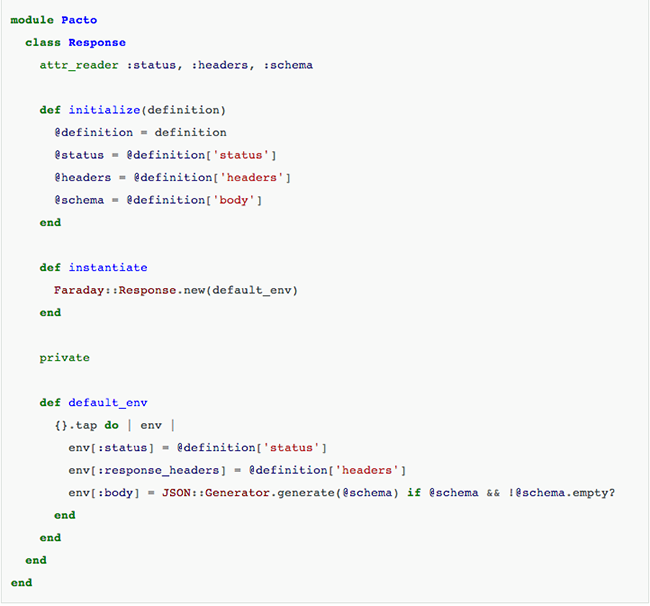 Let’s see how we can refactor some code in a more disciplined manner, keeping the tests always on the green. Instead of working on some contrived User class we are going to use a real example, the class Request from the Pacto project. You don’t need to understand what the class does, just pay attention to the code structure and how we apply the refactorings iteratively. This class has many small issues, but the main thing I want to do is to remove theinstatiate method. 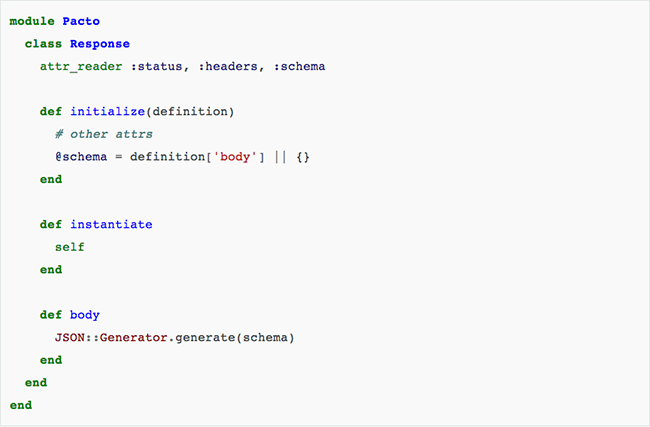 This method is forcing the Pacto codebase to deal with instances of a foreign class, Faraday::Response. 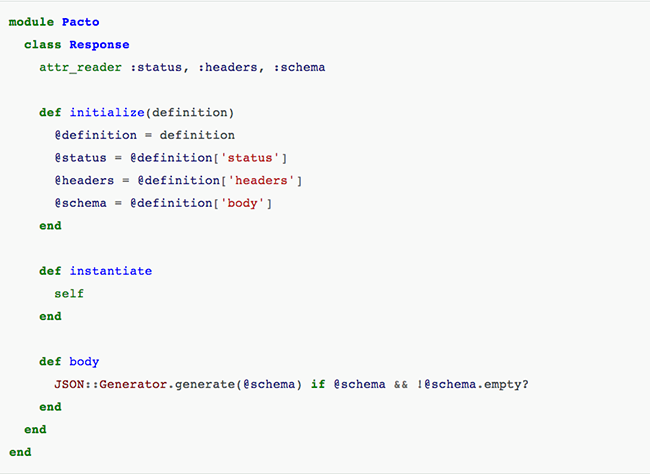 The thing is that Faraday::Response is a very simple class, and we can easily implement the interface we need on the Pacto::Response class itself, eliminating the dependency on external code. Step 0 – Check the current tests Before we start to refactor, a very important step is to check if the code in question is actually covered by tests. A quick way to do it is to just do the refactoring, in our case simply remove the instantiate method and see if anything breaks. If you get zero red tests, that’s not a good thing! That means you have no way to be sure that your refactorings didn’t impacted the codebase, no safety net to catch your mistakes. There’s a famous phrase that says “refactorings without tests is just changing stuff”. If that happens, just rollback your change and start implementing the tests for the behavior you want to change. Luckily for us Pacto has test suite, so we get a precise red spec if we remove theinstantiate method. The failing spec tell us that we need a method body on whatever instantiate returns. We can see the body definition passed on the Faraday::Response initialization. 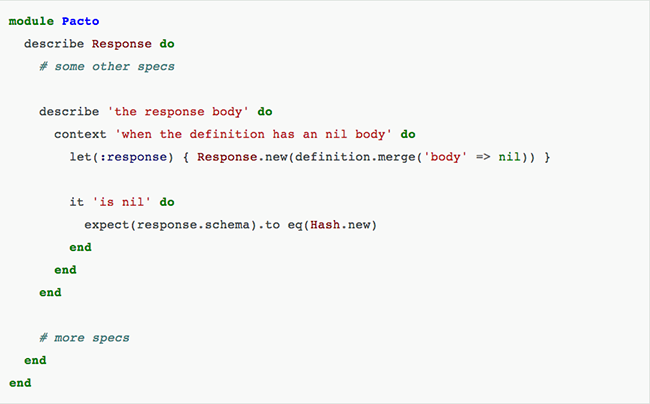 Let’s apply a slightly altered Move Method refactoring to move it from the default_env definition to theResponse class. We run the tests to make sure we didn’t break anything. Since we only changed private methods and we kept the original structure, everything runs fine. It turns out that step one is the only thing we need to do in order to be able to replaceFaraday::Response with self on the instantiate method, so we change the method. That’s probably the most useless method ever, but remember, we want to keep the tests green. By allowing this travesty to live a little longer on the codebase we can be sure that nothing will break and move forward with a few other refactorings before paying attention to other parts of the Pacto codebase. So we have a private method that’s not used anymore. Safest refactoring you can have, we don’t even need to run the tests for this one, right? Well, remember that in Ruby private methods can be called with send (a very bad practice, by the way), so you are never totally sure that’s something is not important just by eyeballing a class. Always run your tests. 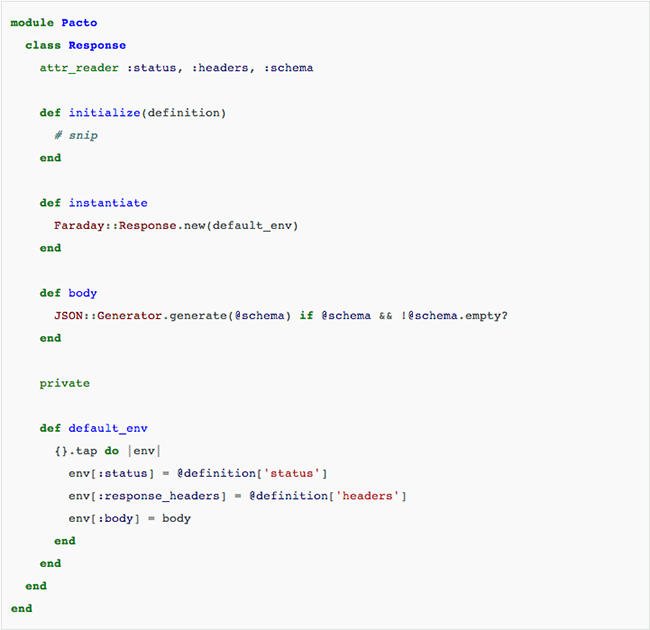 Thankfully Pacto is not a metaprogramming happy codebase, so our tests still run green after removing the default_env. Another piece of private unused code, same rules as the previous step. Finally the class is looking good enough and we can go forward and remove theinstantiate method. Whoever is using that method can just use a Response instance instead. For this step we simply delete the method and fix all the broken specs. Thankfully in this case, the Response class was used only by another class, so it was a very straightforward process. For cases were you have many dependencies, you might let the offending method live for a little longer and replace each use separately on work on each case separately. There’s still some things we could do on this class, like turn it into a Struct, but it’s good enough. Knowing when to stop refactoring is as important as knowing how to do it, the world is full of yaks and rabbit holes. Today I will post this tutorial of Jmeter about how use dynamic data from a CSV (Excel or other) file, because a follower asked for some Jmeter’s tutorial. I did the same here and didn’t have any problem. So, if you have any question/suggestion, just write below ! 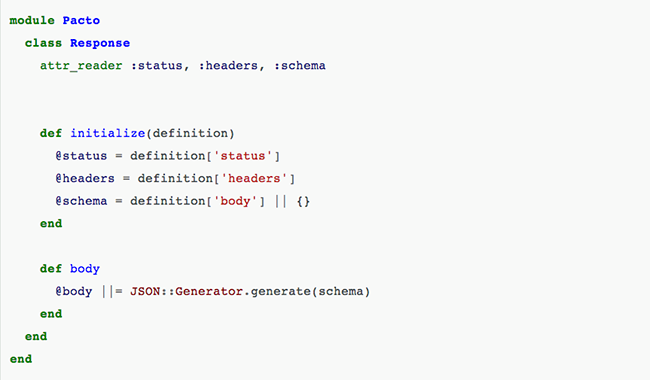 Selenium’s ‘assert’ and ‘verify’ commands might occasionally fail thanks to the asynchronous nature of the Ajax. It may happened that the result doesn’t come back from the server immediately and while ‘assert’ and ‘verify’ commands already trying to verify a new value immediately. Not experienced testers would recommend to add a ‘pause’ command for a few seconds before the verification. The ‘pause’ suggestion may work in certain cases, because Ajax call may be not completed after pausing for a specific time due to slow machines or network. If the tester set the long pause time it will make the test unacceptably slow and drastically increase testing time.